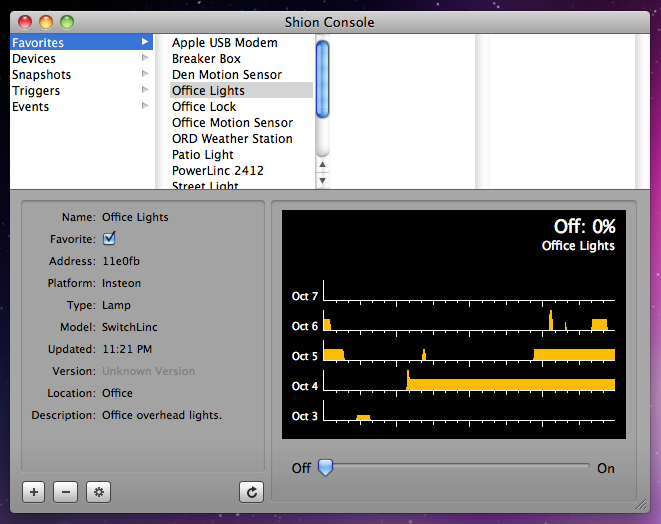 Shion is a complete desktop home automation system for Mac computers. Using Shion, monitor & control a variety of household devices: lamps, thermostats, chimes, power meters, and more! Shion includes features to help you manage entire rooms and tools that allow your devices to respond intelligently to changes in the outside environment. Shion is a free download for Mac OS X computers (10.4 and higher), so start building your smarthome today! In addition to providing a convenient remote control, Shion also keeps a history of how you used devices in your environment. Interested in tracking how much time you spend late in the office? Review how long you leave the light on? 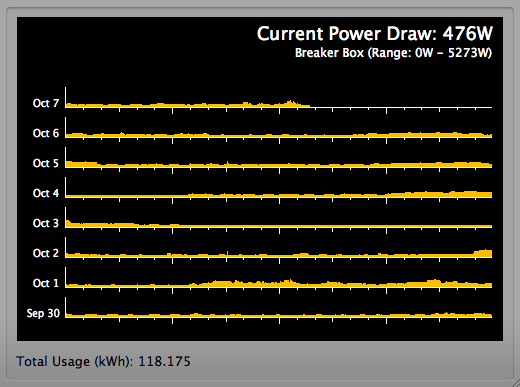 Wondering why your power bill is high? Let Shion talk to your smart meter and find out. Shion makes history visible to help you plan for the future. Looking for a way to keep an eye on things while on-the-go? Shion Touch for iPhone, iPad, and iPod Touch devices gives you a view and control of your environment, no matter where you are: in your neighborhood, across town, or across the world. Shion Touch gives you the same powerful controls and the same monitors and graphs you enjoy with the desktop software. Restore your snapshots, activate your triggers – it makes no difference where you are. Don’t let distance be your excuse for why you left the lights on. The Shion applications are 100% free. Furthermore, due to the generous sponsorship of Power2Switch, Shion Online accounts will also be free through the end of 2012. Shion is compatible with a variety of X10, INSTEON and networked devices. Support for new devices is added in each new release. Using Shion Touch for iOS devices, you can monitor and control your environment on-the-go. Set up your environment exactly how you want it, and then take a Snapshot to save it for later. No programming required. 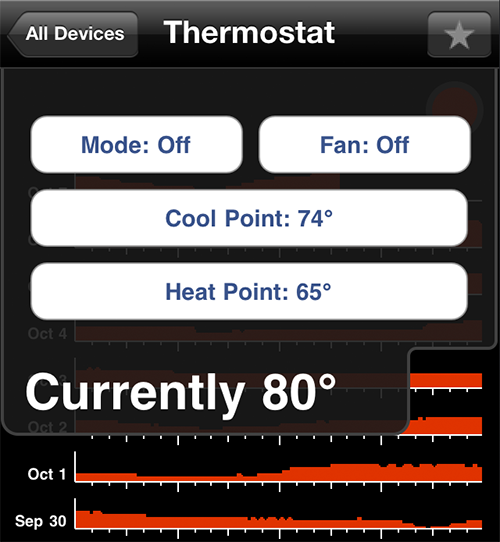 Triggers configure your environment to react to changes in the outside environment: temperature changes, specific times, your location, and more. Wonder what happened while you were out? Check out the Events to review your environment's history while you were away.